Express your personality in a sweet and sassy mini or a retro-darling tea-length wedding dress. Designers such as Amsale, Angel Sanchez, Elizabeth Stuart, and Lela Rose upped the fun factor with details such as pockets, bows, and fresh floral overlays. Wedding dress by Dennis Basso. Wedding gown by Austin Scarlett. Wedding dress by Romona Keveza Collection. Wedding gown by Randi Rahm. 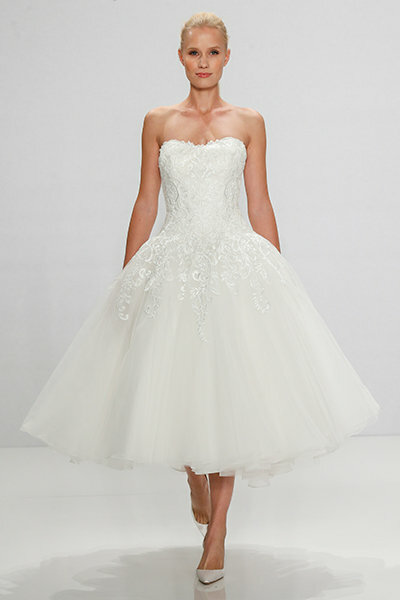 Wedding dress by Lela Rose. Wedding dress by Naeem Khan. Wedding dress by Sincerity Bridal. Wedding dress by Ellis Bridals. Wedding dress by Elizabeth Stuart. Wedding dress by Moonlight Tango. Wedding dress by Angel Sanchez.